Some of the top players operating in the global end-of-line packaging market are Combi Packaging Systems LLC, Gebo Cermex, Schneider Packaging Equipment Co. Inc., Festo Corporation, Pro Mach, Inc., DS Smith Plc., Bosch Packaging Technology, IMA S.p.A., and Krones AG., notes Transparency Market Research (TMR). A number of prominent players are offering technologically-advanced integrated packaging solutions for meeting a variety of needs of their clients, in order to gain a competitive edge over others. Several players are offering automatic and semi-automatic complete end-of-line packaging solutions that can be easily integrated into the existing packaging lines. A number of companies are also focused on offering customized standalone as well as integrated end-of-line packaging solutions. The global end-of-line packaging market stood at US$ 4,221.1 mn by the end of 2017, vis-à-vis revenue. The global market is projected to rise at a CAGR of 4.0% from 2017 to 2026. The various end-use industries for the application of end-of-line packaging are pharmaceuticals, automotive, electronics and semiconductor, chemical products, food and beverages, and consumer products. Of these, the pharmaceuticals industry is the most promising segment and is projected to expand at the leading CAGR during 2017–2026. Meanwhile, the food and beverages segment is anticipated to account for the leading share in the overall market throughout the assessment period. Regionally, Europe is the leading market for end-of-line packaging accounting for the dominant share throughout the forecast period. This will be trailed by North America and Asia Pacific, with the latter expected to rise at a robust CAGR during the forecast period. The substantially rising demand for automation in several end-use industries is stoking the demand for end-of-line packaging in these regions. The vastly rising demand for automating machinery in several end-use industries, notably in manufacturing industries, is attributed to pressing need for boosting operational output. This is a key factor driving the end-of-line packaging market. The intensifying need for modernizing manufacturing facilities is a key factor stoking the demand for such semi-automated and automated technologies. The market is expected to vastly benefit from the rapid strides taken by the manufacturing sector in various developing regions. This is further accentuated by the rising need for modernizing the manufacturing sector. The intensifying need for improving workplace conditions through adoption of automation is a notable factor bolstering the demand for end-of-line packaging solutions. Various end-use industries are adopting a number of developing countries are focused on reducing labor cost and improving their bottom lines. This has stoked the demand for palletized packaging solutions, thereby fueling the growth of the market. 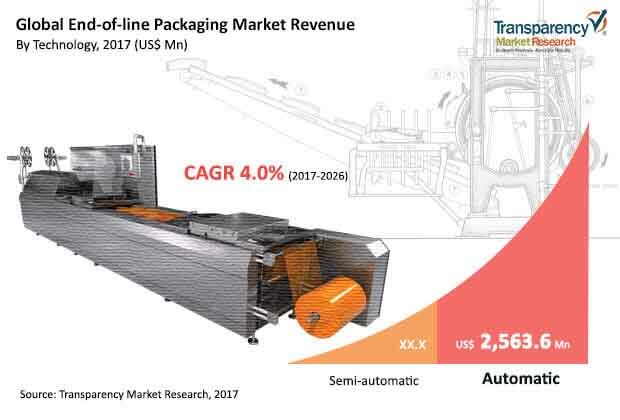 A burgeoning consumer goods industry in various parts of the world is boosting the end-of-line packaging market to manage equipment efficiency and at lower cost. However, the lack of centralized packaging, coupled with uncertain availability of the standalone and integrated products, is a key factor likely to hinder the market over the assessment period. The dependence on vendors and distributors for the supply of end-of-line packaging solutions has acted as a bottleneck for end users. Nevertheless, an attractive rate of return associated with adopting automation in manufacturing facilities and the pressing need for reducing the operational cost in various end-use industries are notable trends accentuating the demand. Furthermore, the wide adoption of robotics technology for light-weight packaging applications is a notable trend accentuating the growth of the market. The rising number of robots in end-of-line packaging leads to less material waste, better production pipeline, and significant operational cost reduction.